The Speedwell GT was a version of the Austin-Healey Sprite that was intended for racing. It was developed by Speedwell – an outside tuning company – and there were some noticeable differences between the Sprite and the GT. First of all, the Sprites are commonly referred to as “Bugeye” (or Frogeye) Sprites because of their inset headlights that gave them a unique – if not dorky – look. This car has the lights in a more traditional place and it’s a fixed-top coupe. Speedwell was founded by John Sprinzel, Len Adams and George Holbert in the late-1950s. The GT was designed by Frank Costin, brother of Cosworth co-founder Mike Costin. 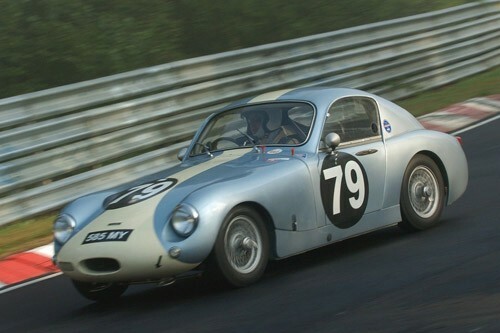 This is one of very few factory-built Speedwell GTs and it is based around a 1961 Sprite Mk I. The engine is a 948cc straight-four making 43 horsepower. Many of the new body panels were aluminium to save weight. It’s a quick car for its class. In the 1970s, it was raced and then parked and forgotten until it was rediscovered in the late-1980s and restored. It has appeared at the Goodwood Revival three times since and is in race-ready condition. It should sell for between $75,000-$95,000. Click here for more info and here for the rest of Coys’ Blenheim Palace sale. This entry was posted in Uncategorized and tagged 1960, auctions, austin-healey, cars, classic cars, coys, gt, race cars, speedwell, sprite by classiccarweekly. Bookmark the permalink.